Metaplastic breast cancer (metaplastic carcinoma of the breast) is a very uncommon type of breast cancer. It can be somewhat tricky to treat and relatively little is known about the causes or the long-term prognosis. These tumors tend to be aggressive, and are less likely to be estrogen-receptor positive or HER2 positive, which limits treatment options. They also tend to respond poorly to chemotherapy. Radiation therapy, however, can be effective, and newer targeted therapies, such as mTOR inhibition may not only improve survival, but raise hope of better treatments in the near future. Metaplastic breast cancer is a form of invasive ductal cancer, meaning that it forms in the milk ducts and then moves into other tissues of the breast. These cancers differ from other types of breast cancer in that these tumors often contain other types of tissue which are not normally found in the breast. For example, these tumors may include squamous cells (skin) or osseous cells (bone cells). The term metaplastic sounds very much like metastatic, but the two have very different meanings. Metaplastic comes from the Greek phrase for "changed in form,'' which is why it is used to describe cells that appear to have changed into those of another part of the body. Metastatic comes from the Greek phrase for "changed in place,'' describing cancer that has spread from its original site to other areas. Metaplastic breast cancer may also be confused for the term metaplasia, as it is sometimes used to describe abnormal findings on a biopsy. When the term metaplasia is used in a pathology report describing abnormal cells in another type of tissue, it is often used to describe cells that are abnormal but not yet cancerous. Some women with metaplastic breast cancer have no symptoms at all and are identified through routine screening. 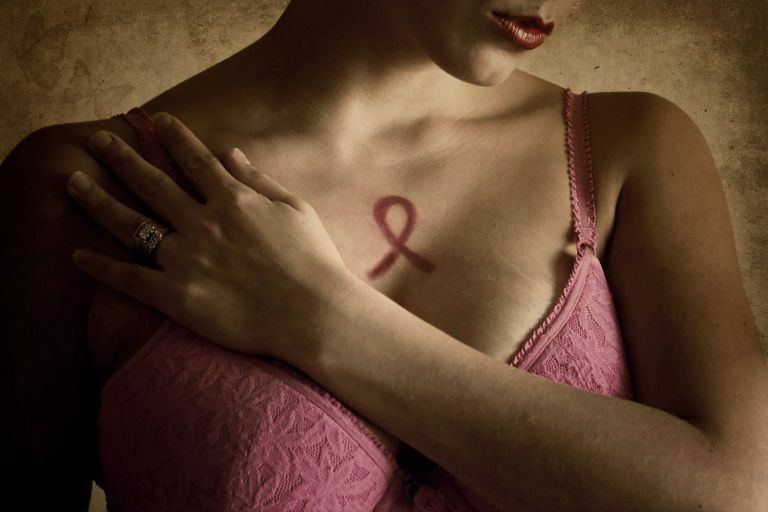 For others, the symptoms are essentially the same as for other types of breast cancer. Tests to diagnose breast cancer are similar no matter what type of cancer is present. Diagnostic mammography. This is much like your routine screening mammogram, except that diagnosing cancer (rather than just checking for cancer) requires more images to be taken and examined. Ultrasound. This uses high-frequency sound waves to produce images of breast tissue. These images help doctors to determine whether a lump in the breast is a fluid-filled cyst or a solid tumor. Magnetic resonance imaging (MRI). This uses magnetic fields to produce images of the inside of the body. Computed tomography (CT or CAT) scan. This creates multiple "slice by slice" pictures of the inside of the body, then combines them into a detailed cross-section picture that can show the presence of tumors. Positron-emission tomography (PET) scan. After an injection of radioactive sugar molecules, a PET scan is taken to see which areas of the body are absorbing the sugar most quickly. Because cancer cells thrive on sugar, they "light up" on a PET scan. PET-CT scan. This combines the technology of the PET and CT scans, allowing doctors to observe which cells may be cancerous and determine more precisely where they are in the body. On mammography, metaplastic breast cancer can appear very similar to both ductal carcinoma and benign masses which can make the diagnosis more challenging. Any of the imaging tests above may be helpful in learning more about a tumor, but a breast biopsy is needed to determine the exact type of breast cancer and to learn about characteristics of the tumor, such as tumor grade (the aggressiveness of the tumor) and receptor status. To specifically diagnose metaplastic breast cancer, the breast tissue must be biopsied, meaning that a bit of tissue is removed from the breast (surgically or with a special needle) and examined under a microscope. A biopsy would generally follow some sort of imaging to confirm there is a cancerous tumor present (as opposed to a benign tumor, or a fluid-filled cyst). It's important to note that no two breast cancers are alike, even tumors that are diagnosed as metaplastic breast cancer. Any of these characteristics may not be true for your particular cancer. Metaplastic breast tumors tend to be aggressive and grow rapidly. They also tend to be resistant to both chemotherapy and hormonal therapies. As with other types of breast cancer, special tests are performed on biopsy samples to look for hormone or HER2 receptors. Hormone Receptors: Some tumors are estrogen receptor (and or progesterone receptor) positive, meaning that estrogen binds to the receptors causing the growth of the tumors. Treatments that either block the receptor or reduce the amount of estrogen in the body can limit the growth of the tumor. HER2 Receptors: HER2 testing can determine if the tumor is HER2 positive, meaning that the cells have an increased number of HER2 receptors on the surface. Growth factors bind to these receptors causing the growth of the cancer, and medications that block the HER2 receptor can thus interfere with growth. Overall, roughly 25 percent of breast cancers are HER2 positive, but it's uncertain exactly how common HER2 positivity is in metaplastic breast cancer. Due to being so uncommon, the best treatment modalities aren't really known, but it appears that surgery to remove the tumor and radiation therapy are of greatest benefit. The low frequency of this type of tumor also means that a tried-and-true course of action in note readily apparent. A lumpectomy or mastectomy is the most definitive treatment. Since metaplastic breast cancers tend to be larger than other types of breast cancer at diagnosis, mastectomy may be needed instead of lumpectomy. For tumors that are estrogen receptor and/or progesterone receptor positive, hormonal therapy is often used. For premenopausal women, the medication Tamoxifen is most often used. This drug works by binding to estrogen receptors on breast cancer cells so that estrogen cannot bind (estrogen ordinarily binds to these receptors and causes the growth of estrogen receptor positive tumors). For women who are postmenopausal (or those who are premenopausal who have received ovarian suppression therapy, treatment with an aromatase inhibitor is usually used. Aromatase inhibitors work by blocking the conversion of male hormones (androgens) to estrogen, thus reducing a growth factor for some breast cancers. Tamoxifen and aromatase inhibitors can reduce the risk of recurrence by roughly 50 percent. Until 1998 and the approval of the drug Herceptin (trastuzumab), HER2 positive tumors held a poorer prognosis. There are now additional HER2 targeted therapies available, that work by binding to the HER2 protein on cancer cells so that growth factors cannot bind and cause the cancer to grow. These medications are not, however, effective for tumors that are HER2 negative. Many of these cancers are at a higher stage than the average for breast cancer at diagnosis and therefore chemotherapy is often recommended. That said, chemotherapy does not appear to be as effective for metaplastic breast cancer. One of the larger studies to date, a 2017 study looking at treatment options did find that adjuvant radiation therapy was important in preventing local and regional recurrences in metaplastic breast cancer. Treatment options for metaplastic cancers that are estrogen receptor and HER2 negative (triple negative) are more limited (since chemotherapy is not particularly effective), but recent research offers promise. A 2018 study looked at the response of these tumors to mTOR inhibition (a type of targeted therapy) with the drugs Afinitor (everolimus) or Torisel (temsirolimus). It was found that people with metaplastic triple negative breast cancers had better outcomes than those who had non-metaplastic triple negative tumors. Not only is this hopeful from a treatment standpoint, but it better identifies a pathway that may be targeted to stop these cancers in the future. There are many clinical trials in progress for breast cancer looking for more effective treatments or treatments that have fewer side effects. While there are many myths about clinical trials, it's important to keep in mind that every treatment we currently have available was once evaluated in a clinical trial, and sometimes clinical trials offer the best option for treating breast cancer. For example, the use of a P13K inhibitor (buparlisib) for metaplastic breast cancer was found to have a durable response (long lasting response) in an isolated 2018 report. Having such a rare form of breast cancer may leave you feeling isolated and confused, but with access to the Internet, people don't have to feel as alone. While it's unlikely that you have a support group for metaplastic breast cancer in your community, you can connect with others facing this diagnosis via social media. Many people find it helpful to participate in general breast cancer support groups and support communities as well. It's also important to become educated about your cancer and research that is being done, and be your own advocate (or have a friend who can advocate for you) in your cancer care. If you've been diagnosed with metaplastic breast cancer, you may find it disconcerting that less is known about this type of cancer. It's sometimes helpful to seek care at one of the larger cancer centers (such as one of the National Cancer Institute-designated cancer centers) that are more likely to have surgeons and oncologists who have experience with this type of cancer. Fortunately, as noted with studies on mTOR inhibitors, research is being done, and newer and more effective therapies are becoming available. Levrer, C., Berriochoa, C., Agrawal, S. et al. Predictive Factors on Outcomes in Metaplastic Breast Cancer. Breast Cancer Res Treat (2017) 165: 499. DOI: 10.1007/s10549-017-4367-5. McKinnon, E., and P. Xiao. Metaplastic Carcinoma of the Breast. Archives of Pathology and Lab Medicine. 2015. 139(6):819-22. DOI: 10.5858/arpa.2013-0358-RS. Tzanninis, I., Kotteas, E., Ntanasis-Stathopoulos, I., Kontogianni, P., and G. Fotopoulos. Management and Outcomes in Metaplastic Breast Cancer. Clinical Breast Cancer. 2016. 16(6):437-443. DOI: 10.1016/j.clbc.2016.06.002. Basho, R., Yam, C., Gilcrease, M. et al. Comparative Effectiveness of an mTOR-Based Systemic Therapy in Advanced, Metaplastic, and Non-Metaplastic Triple Negative Breast Cancer. The Oncologist 2018; 23:1300-1309. DOI: 10.1634/theoncologist.2017-0498.